Feathers of exotic birds from all over the globe were fashioned into ornate works of art, in striking colors that could complement ladies’ evening dresses. Many of these fans were topped with whole hummingbirds, stuffed and wired into place. Hummingbirds were also sometimes worn on dresses. 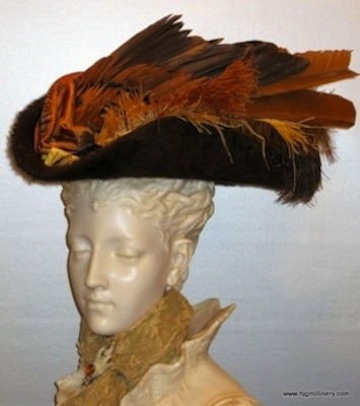 By the turn of the century the fashion had run its course, but fashionable women’s hats in the late Victorian and Edwardian eras were still often ornamented with whole birds or parts of them (e.g., wings). For more on this subject, see Charlotte Gere and Judy Rudoe, Jewellery in the Age of Queen Victoria: A Mirror to the World (2010).
. . . you were in your heyday then and you had on that new hat of white velours with a surround of molefur that Mrs Hayes advised you to buy because it was marked down to nineteen and eleven, a bit of wire and an old rag of velveteen, and I’ll lay you what you like she did it on purpose . . .
She did, of course, the cat! Don’t tell me! Nice adviser! Because it didn’t suit you one quarter as well as the other ducky little tammy toque with the bird of paradise wing in it that I admired on you and you honestly looked just too fetching in it though it was a pity to kill it, you cruel naughty creature, little mite of a thing with a heart the size of a fullstop. In America, the Audubon Society began as what its president, David Yarnold, calls "a fledgling social network" of people, mostly women, who "had come together in community-based chapters to take on a fashion industry that was slaughtering birds for hat feathers." The Audubon Society formed in 1886 to take concerted action against these mass slaughters of North American birds to supply plumes to the fashion industry. By 1904 (not to mention 1922), the Society had heightened awareness of the problem among society women in Boston, started movements toward state and national legislation, and established the first Federal Bird Reservation, the beginning of the National Wildlife Refuge System. The story in the United Kingdom was very much the same. The Sea Birds Preservation Act of 1869 was the first British law to protect wild birds, though Parliament did it to protect sailors from shipwreck more than the birds themselves. In 1889 Emily Williamson of Manchester founded a group called the Plumage League specifically to protest the use of feathers in women's hats. In 1899 the women of her group joined with another such group to create the national organization called the Royal Society for the Protection of Birds. The RSPB pursued tactics much like those of the Audubon Society: conversion of promiment society ladies, obtaining a royal charter, petitioning Parliament for laws banning the use of feathers by the fashion industry, founding wildlife reserves. 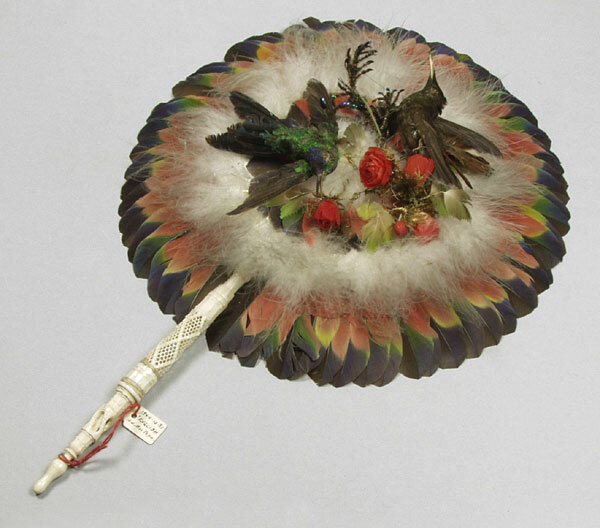 Late Victorian feather fan, displayed in Pitts Rivers Museum, Oxford. Source: www.prm.ox.ac.uk. Edwardian traveling hat decorated with bird's wing. Source: www.petpeoplesplace.com.